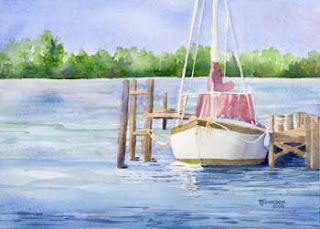 This little boat will be the next blog lesson starting this weekend. My level two class just completed it and I think all of their paintings came out great! The biggest part of this lesson was the study of water. If you can't visit the blog each day, you can visit occasionally (become a Follower!) and print off the archived lessons. If there are past lessons that you would like to try, just go to the etsy shop, as above, and when ordering let me know which lesson you would like.